This annual fair runs from 10:00a.m. until 12:00 noon and is free and open to the public. It brings together state and local resources for seniors and their caregivers in one convenient location. 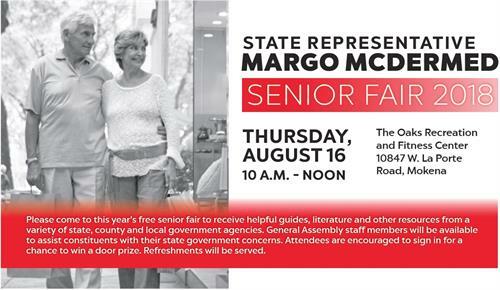 In addition, staff from my district office will be available to assist constituents with any state government concerns. Refreshments will be provided and attendees will have the chance to win door prizes. For more information on the event, please call the District Office at (815) 277-2079. For more information on the event, please call the District Office at (815) 277-2079.